Vancouver is not unique in that venue. Gastown, 1860’s, was the first “Vancouver” neighborhood twenty years before the official founding of the city in 1886. Named after “Gassy” Jack Deighton – a pioneer entrepreneur and saloon keeper – who brought natural gas lines into this area of docks, warehouses, whore houses and anything else one can think of in a frontier port. After its destruction in the Great Vancouver Fire of the same year the city was officially incorporated, it was rebuilt in late 19th century brick buildings lined with cobbled streets. Yet it remained a rough European immigrant port district until its further decline during the Great Depression, and through the 1960’s, into a slum. Fortunately well-meaning urban planners were thwarted in their attempt to demolish the 19th century brick neighborhood. Unfortunately, Gastown today is “quaint” in that sweet, teeth jarring tourist up-scale shadow of its original self. 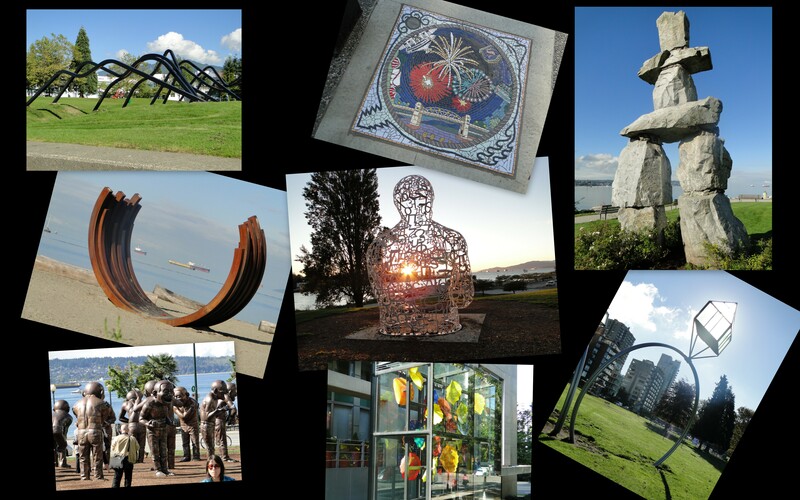 Set only a few blocks from the cruise piers/Canada Place of Downtown on Water Street off of Hastings Street, it’s a neighborhood of cheap souvenir shops, expensive designer showrooms, cafes and some exquisite art galleries – if you can afford the multi-thousand dollar price tags. 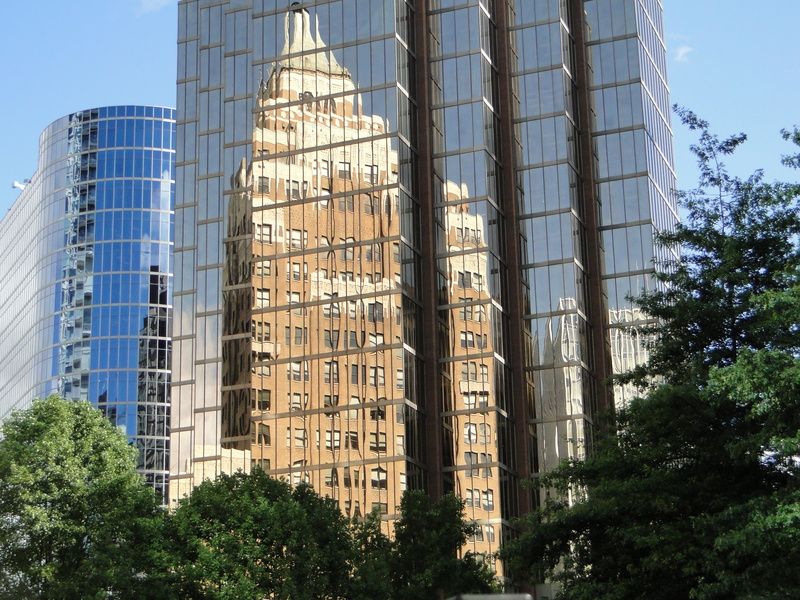 Like most of central Vancouver, its residents are young, upwardly mobile professionals who can afford the multi-thousand dollar rents for condos. 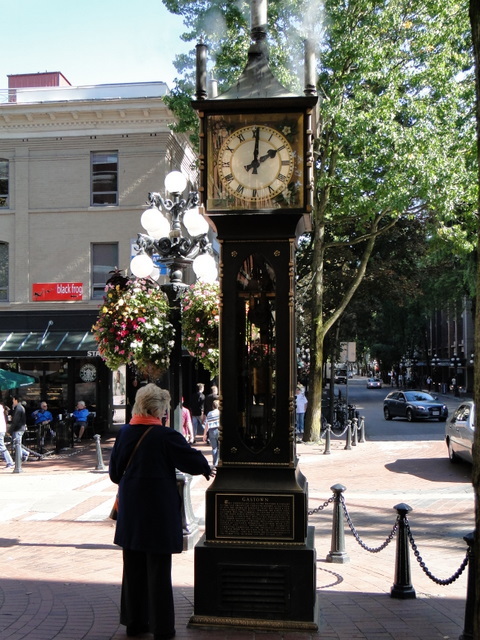 Gastown’s most interesting attraction is the Steam Clock. Conceived over a hundred years ago but not built until the 1970’s, it’s “chimes” are steam operated- not unlike a river boat – by Vancouver’s distributed Downtown steam-heating system. 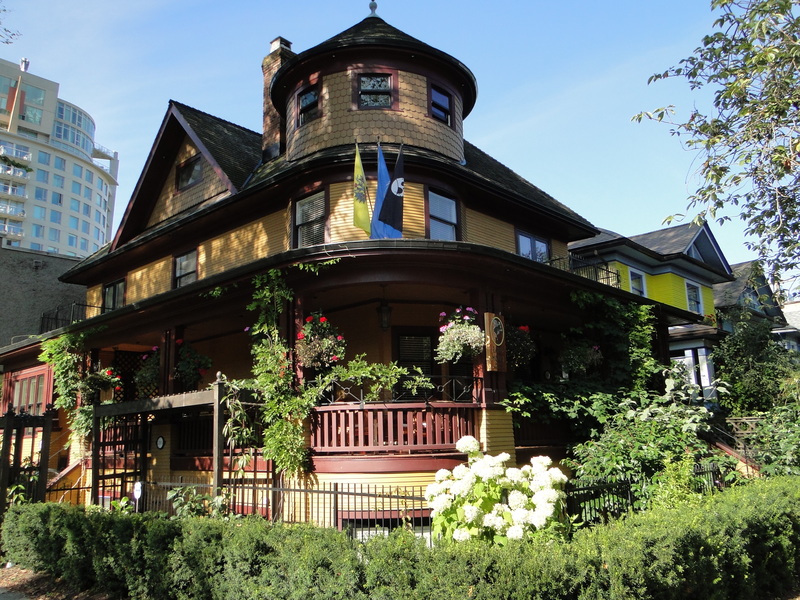 Located on the corner of Cambie and Water Street, it sounds every 15 minutes and is definitely worth walking through the crowded, flower bedecked streets to observe. 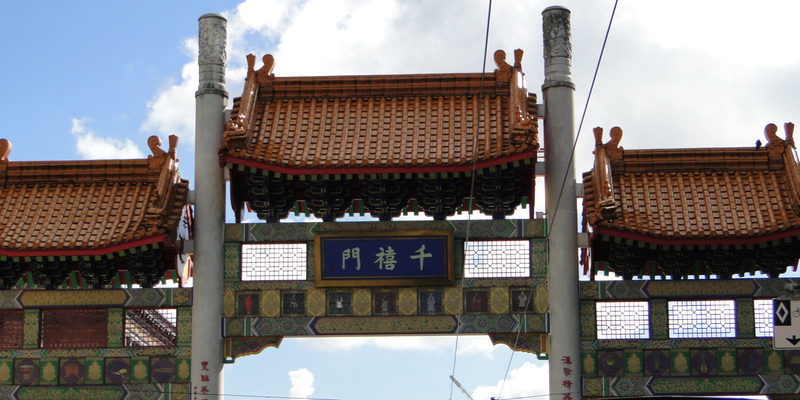 Vancouver’s Chinatown – the third largest in North America – is no longer the ghetto that many Asian neighborhoods once were considering that the city’s population is 30% Chinese – many among the wealthiest residents of the city. It’s separated by a couple of blocks from Gastown by an odd stretch that is populated by drug dealers and prostitutes – perfectly safe in the daytime – traversed by all the tour buses ( note: no tour bus commentary – why?). Except for the Sun Yat-sen Classical Chinese Garden and the Chinese Cultural Center there is no reason to visit Chinatown unless you wish to buy inexpensive trinkets. Downtown is actually the name of Vancouver’s central core, although it is in subdivisions which are discernable today only by architecture or color – not racial, rather the rainbow flag. The 1886 Great Fire not only rebuilt Gastown but expanded the city creating new neighborhoods for Vancouver’s growing wealthy. The mostly British merchant class built spacious landscaped Victorian mansions and, in the early 1900’s, many Arts and Crafts houses. The vast influx of wealthy Chinese British passport holders from Hong Kong in the 1980’s and 90’s, and Vancouver’s subsequent economic boom, rebuilt Downtown (re: tore down the original housing) with luxury glass high rise condos. Yet even if this very expensive “urban renewal” is architecturally soulless, this is Canada. Real estate developers have to comply with strict codes requiring public art installations, inspired landscaping, public access through the developments – bike paths, pedestrian walkways and public ownership of the extensive waterfront. Robson Street, which runs the full east/west length of Downtown, is the fashionable shopping street but the Champs-Élysées it is not. Armani and Cartier are sandwiched between hundreds of small locally owned shops that make me wonder how they can afford the rent – obviously considering the crowds of shoppers they can. To its immense credit, the shops are mostly locally owned and not chain stores. It’s a carnival scene with Bentleys and Mercedes parked in front of non-descript storefronts. Granville Street was once Vancouver’s main shopping district but it fell on hard times after the Great Depression. Fortunately that means it still contains many original Art Deco buildings and is on an economic rebound. Yaletown, next to Granville Street, is a mix of residential lofts and hip stores in restored industrial buildings, as well as glass condos catering to the growing affluent population of under 35-year old professionals. West End is the wealthiest area and, to some extent, what’s left of the original Downtown. 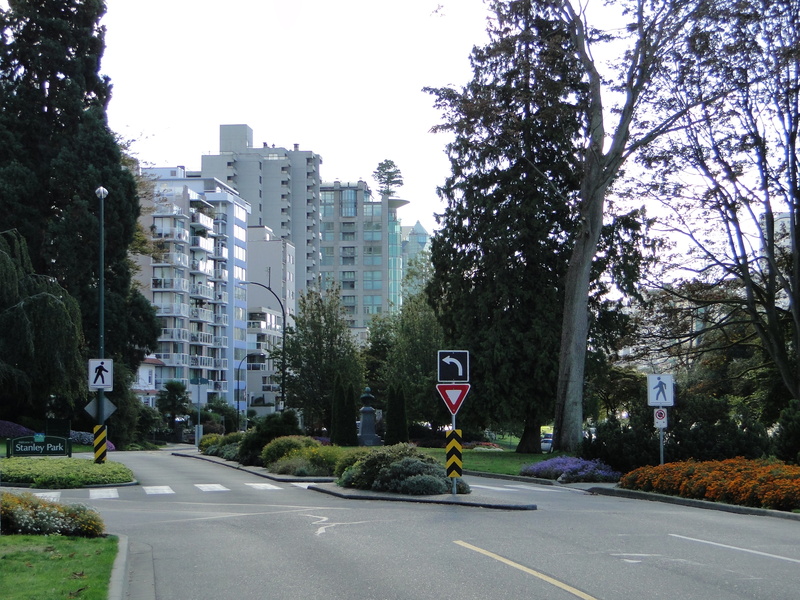 Tree lined streets, especially Bute Street, is a low rise haven of excessively expensive Craftsmen houses, Art Deco apartment complexes, and young families enjoying exquisite pocket parks. The noise and traffic bustle of the shopping district, only a few blocks away, seem worlds apart. 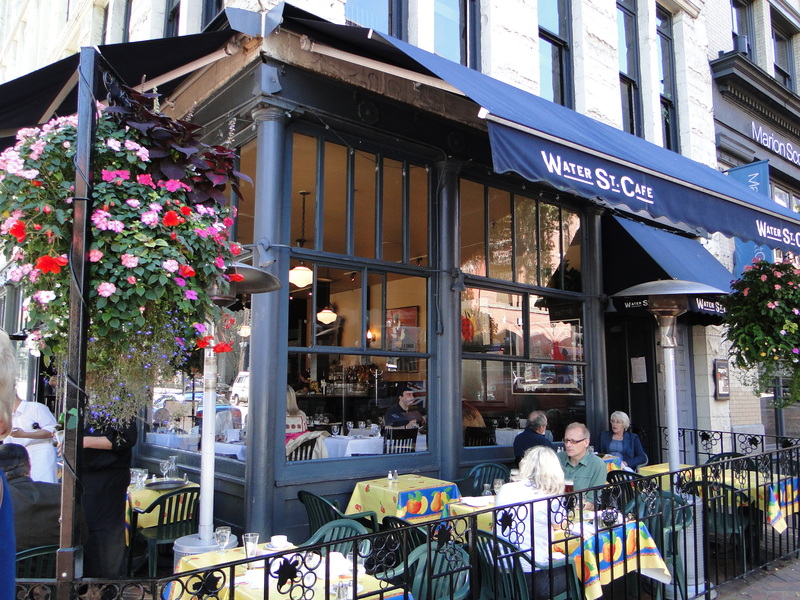 The West End is also home to one of Downtown’s most unique neighborhoods, Davie Village – the heart of Vancouver’s gay district. Fuscia painted bus stops and trash cans decorate a vibrant shopping and café area – fully integrated with the non-gay community (remember, this is socially advanced Canada where gay marriage was legalized years ago). The Davie Village Community Garden, at the corner of Davie and Burrard Streets, is the most beautiful community garden I have ever seen. 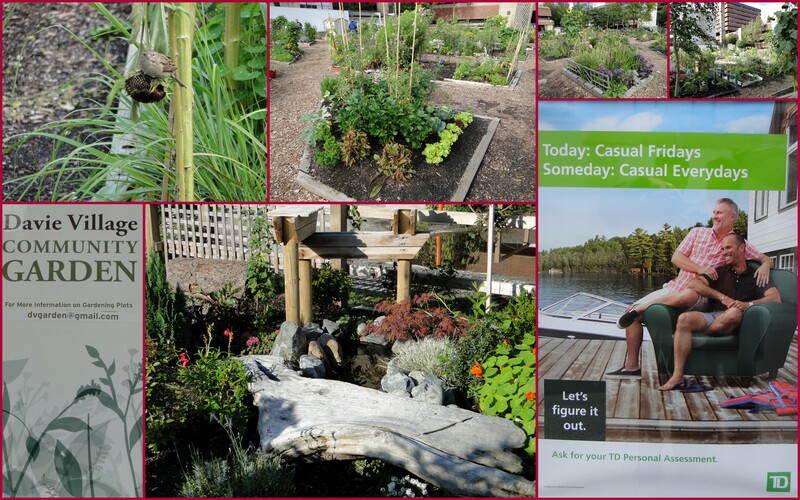 More non-edible plants than vegetables, it’s a fitting symbol of the commitment of Vancouver’s residents to preserving green space within the urban landscape. The incomparable Stanley Park (see next blog) borders the West End. 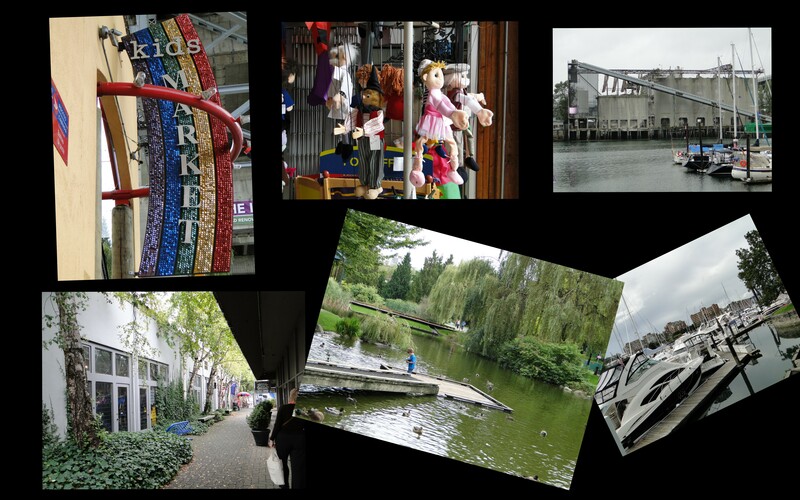 Granville Island, situated in False Creek between Downtown and South Vancouver, was once an industrial center. After years of decline and neglect, it was revitalized a couple decades ago into the cultural/shopping/tourist/entertainment district of the city – beloved and much frequented by locals. The stunning Public Market (see next blog) is the major draw for locals, as well as mediocre restaurants, the excellent Arts Club Theatre of Vancouver, the Emily Carr University of Art & Design, trendy shops, the best seafood stores ever (!! ), an entire toy store mall and park devoted to children and terrific buskers (licensed street performers). Sandwiched between the Island and Downtown is an enormous yacht harbor, reminding you that water surrounds. Nearly every structure is a renovated industrial building and one old company, a cement plant, still operates on the island. 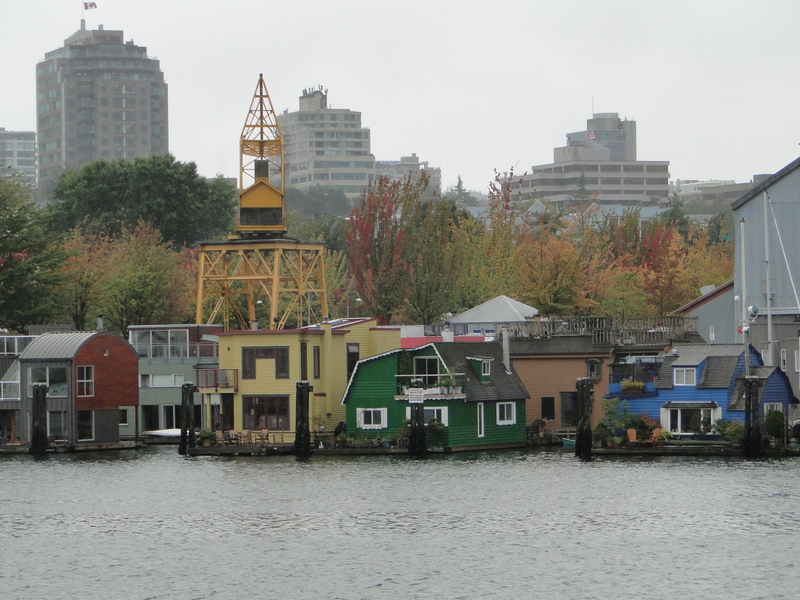 A small, unique collection of multi-million dollar floating houses line False Creek east of the cement plant. 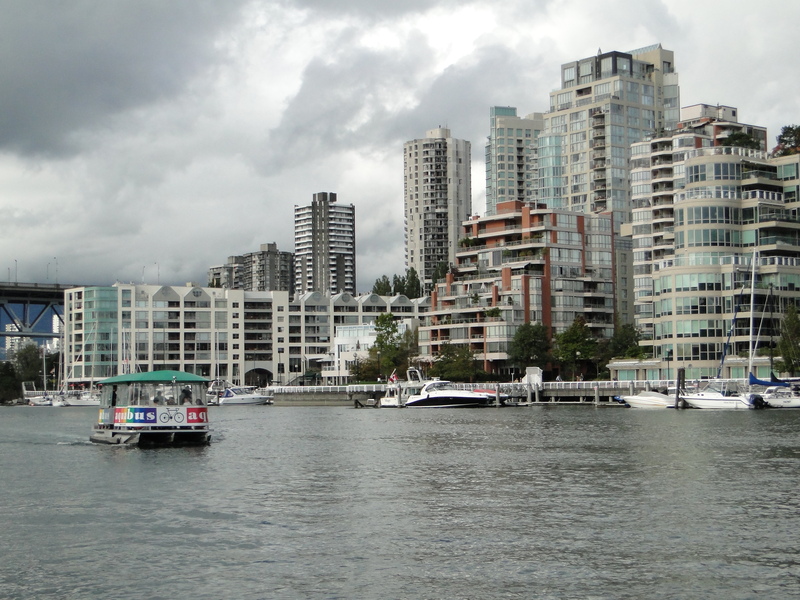 Just over the Burrard and Granville Bridges, and opposite Granville Island, is South Vancouver. At first it seems non-descript as one views the vast Molson brewery and a rather stark, treeless commercial district until you pass row upon row of car dealerships – Lamborghini, Lotus, Mercedes, BMW, Lexus, Bentley (not a Chevy or Ford in sight). Rising quickly up forested hills are modest houses and low-rise condos giving way to ever larger water front/view residences – everything with starting prices in excess of one million dollars. 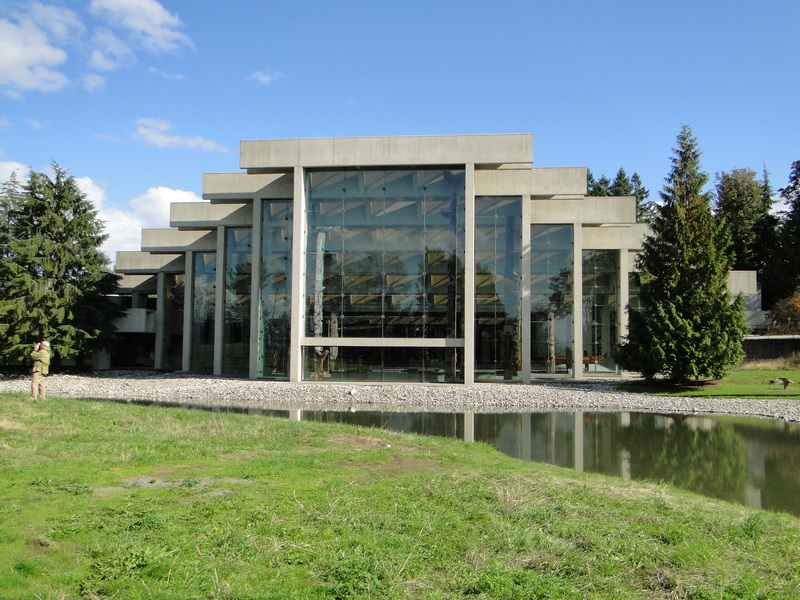 The reason for a tourist to visit South Vancouver is to walk around the spacious University of British Columbia campus and spend at least half a day at its stunning Museum of Anthropology (sorry, you’ll have to read my next blog). UBC’s MOA is a reason in itself why a traveler must visit Vancouver!! Vancouver has an excellent and inexpensive public transportation system which, oddly enough, the official tourism department seems reluctant to advertise or supply any information on its workings. I believe the tourism officials want to promote the excessively expensive taxis in the city. (Do not take taxis unless you absolutely must!) The system, Trans Link, includes buses, subway and elevated (the Sky Train). They are integrated but, given the lack of support by tourism officials, they require a learning curve – in my case, three days. First I used the system’s web site trip planner until it proved as unreliable as just about any other one I’ve ever used (first bus trip using the site left me off two miles from my destination.) Then I realized, “I’m in Canada!” The bus drivers have to be genetically friendly!! And they were!!! All I had to do was ask, and I got more information than I needed. 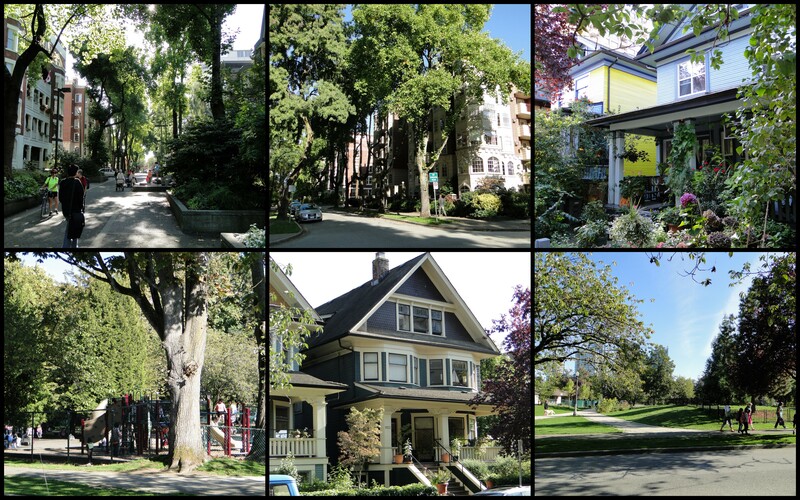 With that knowledge, I discovered the real neighborhoods of Vancouver – once more ignored by tourism officials. 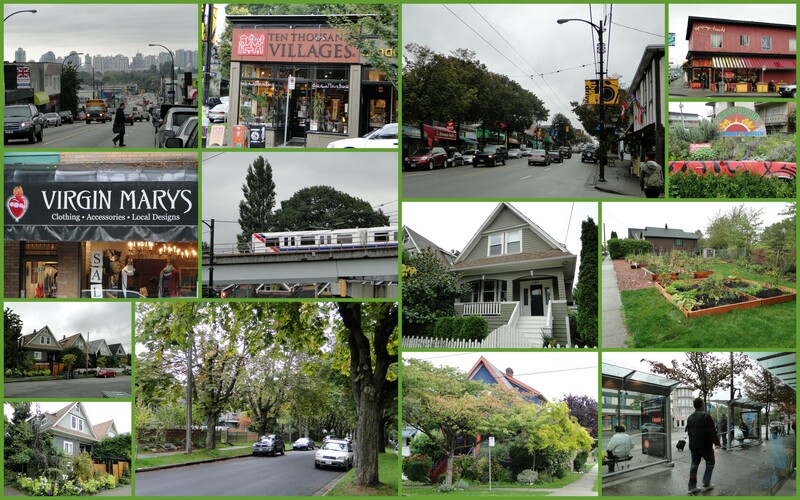 The Commercial Drive and Main Street Districts, east and north-east of Downtown, were once, and somewhat still are, the non-British European “Little Italy, Little Portugal, etc.” working class neighborhoods of Vancouver. Not as pristinely scrubbed as Downtown or the South side with a mixture of dollar stores, small businesses and streets lined with Craftsmen houses that make a lover of this architecture well up with tears of joy, this is the Vancouver in which I felt most comfortable. It has not lost its ethnic roots only that most of the old European communities are now Vietnamese, Thai, Pilipino, North African, Middle Eastern and Latino. The mix of languages, store signs, grocery stores and restaurants is dizzying. Historic architectural codes are preserving the extensive streets of early 20th century housing encouraging an influx of professionals, academics, artists and entrepreneurs who can buy/rent the “affordable” housing in the districts – starting prices for single family houses in the $700K and studio apartments in the $700/month range. Community gardens proliferate and Commercial Street in particular is colorful, has a bounty of ethnic restaurants – including well established Italian and Greek – and beautiful views of the Downtown skyline. 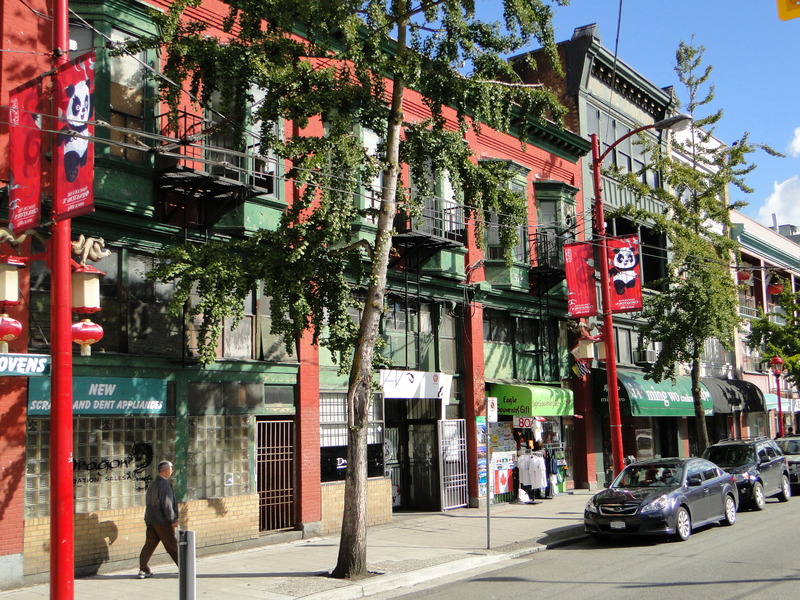 Main Street is less gentrified and the center for both Asian supermarkets and Vancouver’s antique district (an affordable antique district). Despite some misgivings with the expensive glass jungle and overly tourist orientation of Downtown, Gastown and Chinatown, overall Vancouver is a highly livable city – if you can afford it – set on the edge of some of Earth’s most spectacular landscape. Pedestrians rule, with cars – even with fast drivers – dutifully stopping at the pedestrian crossings at nearly every intersection ( violations bring hefty fines). Trash on the streets is non-existent (and no, that’s not an exaggeration!) even though trash cans are not common – people simply do not litter (I know, it’s an unthinkable concept in the USA). Everyone picks up after their dog – if you forgot a bag, public boxes with bags line the extensive landscaped walkways throughout the city (and this is a city where I think it’s obligatory to own a dog). Public art, fountains, gardens and parks proliferate softening the urban reality, and everywhere there is the sea, the forested mountains and the mist shrouded islands. NEXT: What to see and eat in Vancouver.